If you make no other preserves this year, make this one. I’m serious. If you were here, I’d grab your lapels and lean disconcertingly close to your face whilst muttering this assertion. Look at that colour! Now imagine that colour as a taste explosion on your tongue! It’s incredible! I’m using far too many exclamation marks!!! Help meee!!!!!!!! For years I thought I disliked raspberry jam. No, I did actually dislike it – because all I could focus on was the seeds. A few years ago I was given a huge bag of raspberries and decided to make some jam because we’d all eaten as much of the fresh fruit as we could. Since I was running a bit low on jars, I thought I’d reduce the volume a little by sieving out the seeds and wow – what a difference it made. Without the distraction of the seeds, it was just pure, unadulterated flavour. Astonishing! This is now my number one favourite preserve. To which I say, “Actually, not so much”. Lets address possible objections one by one. Huge vats of boiling fruit. Its always puzzled me why, for the most part, jam recipes consist of vast quantities of fruit. Yes, I know it’s all about preserving nature’s bounty for the cold winter months, but if you’re new to jam-making, and possibly you’re not sure whether you’re actually going to like a recipe, investing in huge quantities of ingredients might seem a little daunting. And even if it turns out that you DO like the recipe, you then have huge quantities of jam to get into jars and make sure it doesn’t get mouldy. Then there’s the giant preserving pans required. Actually, that’s not true. Preserving pans are really just large versions of ordinary pans and they’re big because of all the huge quantities of fruit that most recipes call for. They’re also large because they need to provide a large surface area to help with the evaporation of excess liquid, which will eventually lead to a jam setting. If you’re working with a small amount of fruit, there’s no reason why a broad, regular pan won’t do just as good a job – a deep, 28cm frying pan, for example. 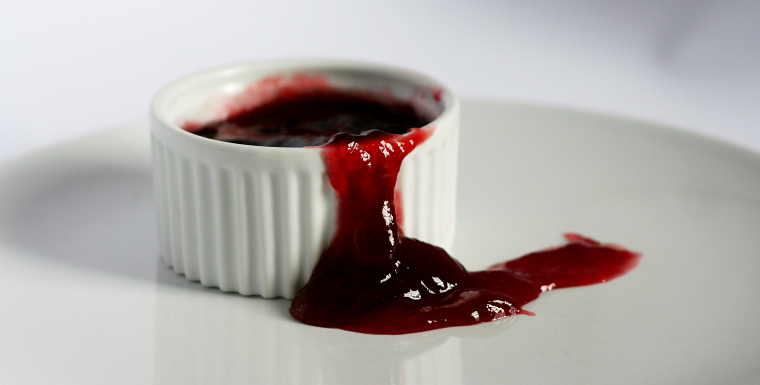 Not all jam requires vast quantities of sugar – it all depends partly on the fruit and partly on personal taste. Sugar is what preserves the fruit, so there is a minimum level below which you should not stray if you want the results of all your hard work to last. Apart from that, its pretty much down to personal taste. I don’t have a sweet tooth, yet I love seedless raspberry jam. Pectin occurs in fruit in varying concentrations, and, together with some kind of acid, is what helps jam to set. If a fruit is low in pectin, you can either combine it with another fruit high in pectin or add a home or commercially produced pectin. The amount of pectin in a fruit decreases as it ripens, so the riper the fruit you’re using, the more likely you’ll need some additional pectin. Raspberries have a moderate amount of pectin, so if you use slightly under-ripe berries with a dash of lemon juice, you can probably get away without using any additional pectin at all. If in doubt, use preserving sugar which has pectin already added to it. This is the point where the concentration of sugar and pectin are such that, when cooled, a jam will set. This is the reason for (sometimes) prolonged boiling. The boiling causes excess water to evaporate, and this in turn means that the concentration of sugar in the mix increases. When enough water has evaporated, the jam sets. Traditionally this has been tested in several ways, but thanks to modern science, these days we can just use a thermometer. You can pick up a sugar thermometer for about £7.00, and it will have the setting point for jam marked at 105°C. Since water boils at 100°C, you can relax in the knowledge that all excess moisture will be evaporated by the time your jam reaches this temperature and your jam is going to set. Hundreds? Really? I thought I was the one doing the histrionics here?? OK, so if you’re dealing with vast quantities of fruit and sugar, you’re going to need a lot of jars, but we’re not here, so we won’t. Calm down. When I was a child, jam was always bottled in Kilner jars, and these type of jars are still available today, with either a screw-down or clip-down lid and rubber ring to make the firm seal that is going to help keep your jam sweet and fresh. When I was at school, we learned how to make jam in ordinary jam jars and to seal the jars with waxed-paper discs, cellophane and rubber bands. There’s nothing wrong with using either of these methods, but each of them have drawbacks: Kilner jars are rather expensive and the waxed-disc method is tricky to get right, and getting it wrong means fuzzy jam. The solution is to re-use jars that would otherwise go into the recycle bin. Using a variety of jars means you can just use small jars to keep the jam fresh or offer as gifts. I find pesto jars particularly suitable: they hold a small amount and they have a freshness ‘button’ on the lid which can be re-set when you make jam. To remove labels, simply soak in hot, soapy water until they slip off. If the labels are a bit more stubborn, use a knife to scrape off the softened label and a scourer covered in washing up liquid to remove the glue. Use a range of sizes and shapes, large and small. If you have a dishwasher, then sterilising couldn’t be easier – pop the clean jars and lids in on a hot cycle. Leave the door closed until you’re ready to use them. In the oven, put jars and lids on a baking tray and slide into a cold oven. Turn the heat to 100°C for 30 minutes. No. The beauty of this recipe is that it takes very little cooking time at all – 3-5 minutes at most. No water is added to the fruit, so there’s not much excess water to be got rid of, and the less a jam is cooked, the brighter the colour and the better the flavour. So if that’s all settled, on with the recipe! 1.2kg raspberries – slightly under-ripe if possible. Wash the jars and lids in hot, soapy water and arrange on a baking tray. Put the raspberries into the oven-proof bowl. Put the jars and raspberries into the oven and heat to 100°C for 30 minutes. This will both sterilise the jars and encourage the juice in the fruit to run and make the next stage easier. Remove the raspberries from the oven. Leave the jars in the oven to keep warm and reduce the temperature to 80°C. Weigh your bowl, write it down somewhere and put the sieve over the top of the bowl. Pour the softened fruit and juice into a sieve and stir vigorously with a wooden spoon to extract as much juice and pulp as possible. NB It’s probably best to do this a small quantity at a time. You need to keep stirring/pressing until there is nothing left in the sieve but a solid mass of seeds. I won’t lie to you, this takes a while, but its well worth it. Keep scraping the sieved pulp off the bottom of the sieve with the back of the knife. Don’t use the spoon, as you might accidentally get some seeds fall into the pulp. Discard seeds. When done, weigh the bowl again and subtract the bowl’s original weight to find the weight of the juice and pulp. Add this and an equal weight of whatever sugar you are using to your large pan. NB Warming the sugar will make it dissolve more easily. Over a very low heat, stir gently until all the sugar has dissolved. Taste and add lemon juice if liked. Turn heat to high and, using a sugar thermometer, heat rapidly to 105°C. NB This shouldn’t take long at all. Even if it’s not quite reached 105°C, remove from the heat after 5 minutes – prolonged boiling will ruin both flavour and colour. Remove from heat and pour into warmed jars to within 1cm of the top. Seal immediately. As the jam and the air trapped in the jar cools, it will contract and eventually pull the ‘safety button’ on the lid back to it’s original position. After making a batch of jam I love sitting listening to the ‘bink!’ of the lids safely sealing in all that wonderful flavour. Variation: Not much, except to say that you can easily scale this recipe up if you want to make a larger batch. Just be sure to use an equal weight of sugar to pulp and you can make this with any amount of fruit you like. Cost: In season, as little as £1 per pound of finished jam. Fantastic recipe thanks, so easy! I started mine a bit late in the day and as you said, getting all the rasps through the sieve takes a while… I decided to add the sugar and leave in the pot overnight to heat in the morning…. This was a great idea as the sugar had completely dissolved by morning. I used ordinary granulated sugar and no pectin and it has set beautifully. 5star recipe thank you. Awesome! I make jam/jelly a lot but have avoided raspberry jam because of the seeds. Problem solved! I still have seeds, but very few. The jam jelled quickly and the juice/pulp and sugar amounts were perfect. THANKS! Thanks for describing how to remove the seeds. I just made cherry raspberry conserve but gave up on removing the seeds. I didn’t think about cooking the raspberries first to help loosen everything up. Brilliant idea to cook the raspberries first. I have millions of them every year and always sieve for ice-cream, leather and jam but have never known/thought to cook first. It makes it 100% easier. I would use a metal spoon though and when you think you have got all the pulp out then put the seeds back in and do lots of that scraping bottom of sieve with knife lark and you will get tons more. Each step worked beautifully. Berries released juice very easily. Put 3 batches of heated fruit through a fine strainer and used my potato masher to push for juice. Dumped pulp in a bowl, and got quite a bit more juice in that bowl + so I pushed pulp through again. Mine seems to be all juice as there was almost nothing on the bottom of the strainer at any step. Love the color, love the flavor, and finding a conversion chart for this USA canner was easy, too. Mostly love that though this a warm day, my canning job was more fun than chore…..and cool enough that no yucky drops of sweat dripped into my precious jelly/jam. Is it possible to use a juicer to extract the juice for jelly. If so….directions? Thanks. It’s certainly possible to use a juicer, though its effectiveness will depend on the piece of equipment you have. Personally, I have a sieve attachment for my Kenwood stand mixer. KitchenAid also have something similar. My sieve attachment has mesh of differing sizes, so I can choose fine or coarse. Can’t speak for KitchenAid I’m afraid. A less expensive alternative is a mouli sieve, which also comes with a range of mesh sizes. hi – like the idea – am wondering if a mouli would be easier to separate pulp from seeds and if you have used one ever? as I wouldn’t know what kind to buy! also wondering if this is really too sweet for me as the amount of sugar to pulp is higher than jam which would include the seeds in the weight? is it possible to add less and if so how much less? You can certainly use whatever means you like to remove the seeds, I merely opted for the cheapest, assuming that most kitchens would have a sieve and a spoon. There’s no need to go for anything more complex, unless there’s another reason not to use the simplest method. I have used a mouli in the past, but now, as I have a stand mixer, I’ve bought a sieve attachment for that instead. I don’t find the recipe too sweet, but my tastes might be different to yours, so I suggest you try the recipe and taste for yourself. Raspberries are quite a tart fruit, and the recipe does include lemon juice as well. If you’re really concerned, then halve or quarter the recipe given, to produce the very smallest amount before deciding whether to commit. Fab recipe, set easily and warming the raspberries first really helped. Thank you! Sorry to hear your batch hasn’t set. What recipe did you use? Maybe I can help by reading it. Hi i strained the rasps then then boiled them as per jam added lemon and pectin when at jam temperature then bottled them next morning still runny, I then returned them to the boil and added more pectin so this morning jam still runny so looks like i will be making a lot of trifle this year would like your opinion to rescue it.will be using your recipe next time. Oh dear – with all that pectin and still no set, this truly sounds like a dud batch. There are several things that might have caused the poor set – a dud bottle of pectin, overboiling the fruit, fruit too ripe (there’s more pectin in slightly under-ripe fruit). With a liquidiser you’d puree the seeds into the juice, so technically, you could, but I wouldn’t recommend it. I really like raspberries but they don’t grow locally where I live. I saw your recipe a couple of weeks ago and decided to try it with what fruit I could find. The sieving was a lot of work, but it really was worth the effort. Delicious! Don’t chuck the seeds away!! I put them in a jar, add a fair old bit of gin and some sugar and leave for 2 or 3 months. Strain that through muslin and bobs your uncle, delicious Raspberry gin. All very rough and ready but the pulp from a couple of kilos of rasps to 1 to 1.5 litres gin and 3 or 4 tablespoons of sugar should do it. I made the seedless raspberry jam today, no lemon juice, no extra pectin, heated sugar before adding to juice, dissolved slowly then boiled for approximate six minutes, tested on saucer as usual. Result perfect jam which we have just eaten on some homemade scones. hi, used your recipe and had great results but thought you should know preserving sugar does not have pectin added – that’s JAM sugar. Preserving is just larger granules to make clearer jams. Thanks also for the top tip – always learning!